SEE the directory of all tampons on this site. CONTRIBUTE to Humor, Words and expressions about menstruation and Would you stop menstruating if you could? Read 10 years (1996-2006) of articles and Letters to Your MUM on this site. Leer la versión en español de los siguientes temas: Anticoncepción y religión, Breve reseña - Olor - Religión y menstruación - Seguridad de productos para la menstruación. Procter & Gamble kindly donated the box and contents as part of a gift of scores of menstrual products. Below: The leaflet included in the box measures as shown 7 x 5.25" (17.7 x 13.2 cm) to be folded in half to make four pages. Right below you see pages 4 and 1. The Sta-Pacs logo (p. 1, at right) changed from the one on the box, usually a design mistake since you lose "corporate identity." Also, at least modern graphic design tut-tuts too many typefaces, seen here; this too destroys corporate identity. The long introductory paragraph at left seems to give away the tampon's age as belonging to the 30s or maybe the 1940s. Below: Interior of the leaflet, pages 2 & 3. Somebody - not me! - probably crossed out part of number 10 to eliminate "wrapped in sanitary cellophane and is"; I don't think the leaflet would enter the market this way. I enlarged that line in the last image, below. 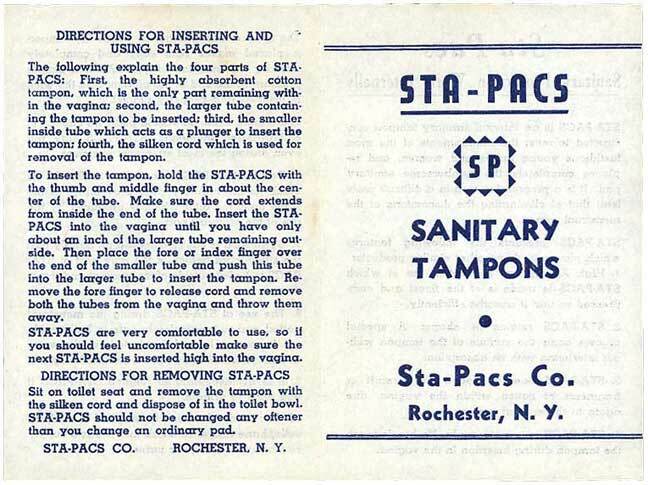 The initial language - "internal sanitary tampon," "completely replaces the cumbersome sanitary pad" - indicates that tampons were still fairly new to consumers. "Most fastidious young ladies and women" and "apply [the tampon]" ring old fashioned. These observations point to the 1930s or 1940s as to the date of this tampon. "Progressive step" is interesting and I wonder what it means. 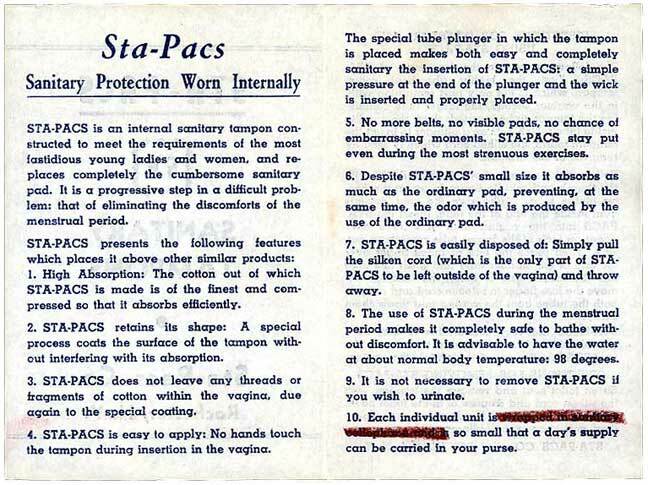 Is Sta-Pacs an intermediate solution? Item 4: "The special tube plunger" seems to be exactly the thing Tampax patented. Is Sta-Pacs just a rip-off? This remark points out that the user might have never seen such a wonder, which emphasizes the case for a 1930s date. Almost all early tampons had no insertion tubes, Tampax again being the exception.